After the "cyclone bomb" storm Grayson struck widespread areas across New England and other densely populated areas in the United States, we've pulled together a detailed breakdown of the disaster response challenges in coastal regions dating all the way back to Hurricane Katrina. Months have passed since Hurricane Harvey devastated parts of South Texas by dumping staggering rainfall over metropolitan Houston – almost 50 inches in some areas – in an event the National Weather Service has called “unprecedented”. Harvey was the most extreme rain event in Texas history, challenged only by tropical storm Allison back in June of 2001, and scientists are pointing to rainfall measurements as an example of increased storm intensity. The frequency and strength of tropical storms are challenging Houston’s risk assessment and disaster management strategies, forcing many residents to put pressure on local government officials and city planners to update emergency protocols. The Memorial Day Flood of 2015, the Tax Day Flood of 2016, and most recently Hurricane Harvey have all exposed Houston’s structural vulnerabilities. Houston metropolitan, which is located in the greater Harris County area, has experienced rapid population growth over the past two decades and is now the 4th largest city in the United States. Infamous for weak zoning regulations and unchecked development, Houston has continued to overdevelop flood-absorbing prairie lands in order to support its almost 6 million residents. There is a lot of undeveloped green space outside Houston’s metropolitan boundary. Because these prairies and wetlands are located in designated floodplain zones, their value is cheap. This has encouraged land redevelopment for commercial and residential use and unfortunately has left many Houstonians vulnerable to extreme rainfall events. While the expansion of Houston’s metropolitan boundary has kept real estate prices and population density low, it has resulted in expansive urban sprawl. Between 1996 and 2011, impervious surfaces in the Houston area increased 25%. Sewer systems and river systems are currently overwhelmed and unable to absorb heavy rainfall, inadvertently directing water to unsuspecting residential subdivisions. Houston has seen more urban flooding than any other area in the country over the past 40 years, said Sam Brody, Texas A&M scientist and urban planner. A significant number of buildings that have flooded over the past 15 years reside outside the FEMA -designated 100-year floodplain, an area considered to have a 1% of flooding in a given year. Becuase of their location, these structures are not required to obtain flood insurance. For many uninsured residents, extreme rainfall events catch them off guard and unprepared. There are natural solutions that can mitigate heavy rainfall. Wetlands and prairies naturally absorb water in their soils. When these landscapes are allowed to function properly, floodwaters can spread out and slowly seep into the ground. Unlike paved roads and parking lots that immediately force water runoff into nearby drainage systems, wetlands and prairies can hold water for weeks. Katy Prairie, located just west of downtown Houston, was once 600,000 acres of flood-mitigating grasslands. Today that land has been reduced to less than a quarter of its original size. Scientists agree that protecting green space and tightening development regulations in floodplain zones is crucial for mitigating heavy rainfall and floods. Jim Blackburn, professor of environmental law at Rice University, points to studies that show prairies can absorb as much as 11 inches of rain per hour. Comparatively, Blackburn says Houston’s current drainage system is designed to clear out only 12 to 13 inches of rain per 24-hour period. Officials and urban planners in Houston need to rewrite current zoning policy to include recommendations made by environmental scientists to ensure that continued urban growth is sustainable and acts to protect residents. As Houston continues to grow in population and severe rainfall events become more frequent, it’s imperative that zoning policies and land use plans recognize the challenges of urban sprawl. Unfortunately, some city officials disagree with scientists and urban planners who argue land development should focus on preserving green space and managing urban growth. Instead, officials are ignoring these recommendations and are opting to spend millions of dollars retrofitting old drainage systems and widening bayous. When questioned about this decision to update existing infrastructure, disaster response management coordinators admitted that these fixes would not protect Houstonians against another Tax Day Flood but chose to continue the facelifts anyways. To be clear, simply preserving Houston’s green space will not protect residents from the next severe rainfall event. Houston is naturally prone to flooding: it’s flat, built along the coast, and is influenced by the warm waters of the Gulf of Mexico. According to Phil Bedient, professor of environmental engineering at Rice University, “Houston is the most flood-prone city in the United States. No one is even a close second - not even New Orleans.” It is crucial that city planners and local officials recognize how current infrastructure failures are negatively impacting community health and how they must rethink current disaster response management protocol. Tightening development regulations to preserve green spaces and protecting residents who live in poorly zoned communities is a first step in establishing proactive, rather than reactive, community safety. Collaboration amongst policy makers and scientists is necessary to ensure future development projects are multifaceted, protecting both the economic incentives of urban expansion and the people who live there. Scientists worry changes in the frequency and intensity of severe weather events are linked to climate change and are likely to worsen over time. Preliminary evidence supports scientists who say climate change is impacting the Atlantic tropical storm season, meaning New England may become more susceptible to tropical storms in the future. Unfortunately, coastal management protocol along the eastern United States was built without factoring in severe tropical storm landfall events. This leaves numerous coastal communities unprepared and vulnerable. Infrastructure here is not built to withstand storm surges of Sandy’s magnitude and disaster response management teams are not equipped financially to handle rebuilding efforts after the storm has passed. 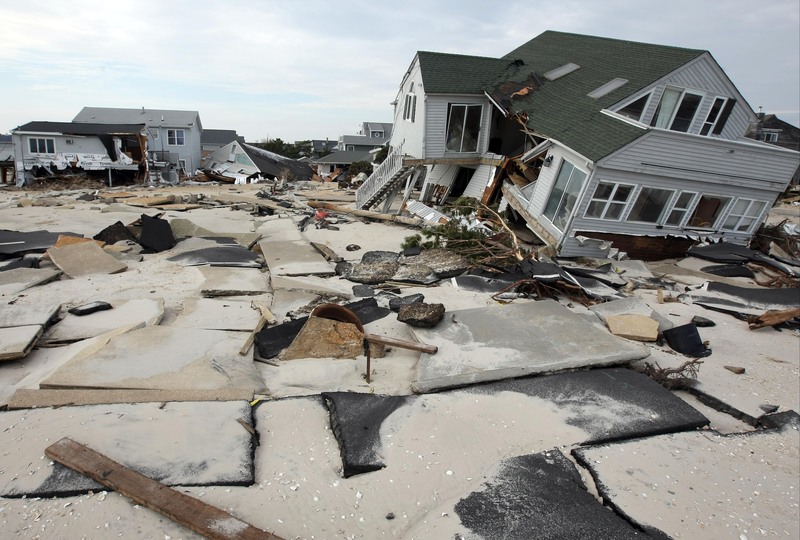 Hurricane Sandy damage in Ortley Beach, N.J.
A 2013 study by the U.S. Department of Commerce provided estimates of the total damage inflicted by superstorm Sandy to impacted communities. New Jersey and New York estimated a combined $78.9 billion in infrastructure damages, far less than the $50.5 billion Congress ultimately approved from the Disaster Relief Appropriations Act. To make matters worse, the $50.5 billion approval was not granted in one lump sum, but to be spread out over the next decade. In the meantime, coastal communities across New England will be forced to allocate money from elsewhere in their budgets to cover these damages. But what can local and state officials do? One answer is to learn from those who have experienced similar disasters, such as Louisiana and the United States’ gulf coast. Since hurricane Katrina devastated New Orleans in fall of 2005, Louisiana has become a new model for coastal management and regularly hosts visitors from around the world who wish to learn from their resiliency efforts. State Congressman Garret Graves has been instrumental in fostering this new internal innovation and aims to increase collaboration across governmental agencies in order to streamline coastal restoration projects. Prior to Hurricane Katrina, Graves said that Louisiana was largely subservient to the Army Corps of Engineers, the federal entity charged with building and maintaining our country’s coasts and waterways. Local officials became frustrated with the bureaucratic red tape that surrounded federal disaster relief aid. While state officials waited for federal aid, Louisiana residents remained vulnerable to the next impending disaster. After Hurricane Katrina devastated much of the Louisiana coast, Graves said there was a lot of reorganizing. Officials started to allocate state funds for future coastal mitigation projects and strengthening their own internal capabilities to push back against the strict regulations and wait time imposed under federal assistance. Coastal communities around the country, including New York and New Jersey, can learn from Graves to increase their own self-sufficiency and be proactive in storm preparedness. Disaster relief efforts are failing at all levels of the government because they are fundamentally reactive-- a necessary response to a catalyst. Current disaster response management protocols fail to help residents prepare in advance because policies focus too much on rebuilding efforts and ignore proactive planning for future incidents. This type of thinking is dangerous to community health because it serves to protect some parts of the population while leaving others exposed and vulnerable. Minority, disabled, and elderly populations are adversely affected by community disasters at proportionally higher rates than their wealthier, able-bodied counterparts. It is crucial for emergency managers to proactively engage with all members of their community, including lower-class residents and those who identify as having access and functional needs. To do this, city officials can establish a special needs registry and determine who is likely to require additional pre and post-storm assistance. This proactive thinking can also determine zones of risk, such as which residents live in areas prone to flooding, and can guide disaster relief funds allocations more effectively. As the accuracy of climate modeling continues to improve, many legislators and disaster response management supervisors should be looking towards climate scientists for answers. If scientists can predict where tropical storms will make landfall, urban planners and city officials can rethink their coastal management strategies. Accurate storm projections can provide information federal agencies need to allocate funds for disaster relief budgets and to create more targeted disaster response efforts. Preparing for natural disasters requires innovation, a willingness to adapt, and most importantly the ability to collaborate. Coastal communities need to develop a creative and comprehensive approach to coastal protection and management. This starts by policymakers recognizing the strengths of leaders from across different industries, from social workers and environmental scientists to urban planners and engineers. Moving forward we must admit our mistakes, build upon our failures, and continue to prepare for unexpected emergencies – the safety of our communities will depend on it.